You might think of bumper stickers, the scrapbook type of stickers or those type of stickers received when accomplishing a task as a child, but I can tell you that Stickers Touch® has nothing to do with any of those stickers. 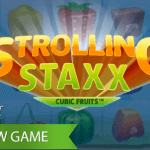 The name of this mobile slot game, developed and launched by NetEnt in 2015, has been chosen because of its sticky character with sticky slot features as seen before in NetEnt’s Jack Hammer™ and Jack Hammer 2™. It has been in August 2013 the Starburst™ slot was released by NetEnt, until today super popular, even though simplicity is a keyword when looking at its design and slot features. 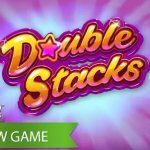 I think there is a good explanation for the popularity of Starburst™ as it has a lot in common with computer games such as Bejeweled and Candy Crush Saga. Bejeweled, for example, has been downloaded over 150 million times, no wonder players at the NetEnt Casinos feel familiar with the colourful gems as used in the Starburst™ slot. Unexpected still, but not a surprise, it seems that a large group of casual players appreciate simplicity and with that the fact that an online slot isn’t packed with slot features. The Starburst™ slot has been the perfect proof, and I am convinced the Stickers™ slot has the same potential. The reason why I believe Stickers™ and Stickers Touch can be as popular as Starburst™, is because of the same simplicity. 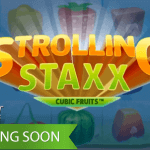 Some juicy fruit symbols, well-known from the traditional slot machines, and a Sticky Wild is all this game has to offer. Not much more than the Starburst™ slot offering a Wild feature and a ‘Both Way Win’. 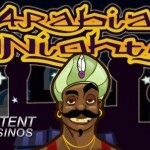 When over 100 NetEnt slots are offered in a NetEnt Casino, you know you can expect a wide diversity of slot themes. 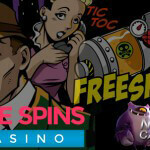 Frighting slots, also available as mobile slots, such as Aliens Touch®, Dracula Touch®, Blood Suckers Touch® and Frankenstein Touch® can’t be missed in any online casino, but to keep a games suite divers cheerful slots must be added too. Over and over again NetEnt proves to be the leading developer of online casino games, because no matter if a frighting theme or a cheerful theme, NetEnt knows how to bring a game to life, adding a perfect design, gameplay and innovative slot features. 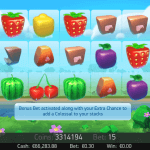 Having a look at the category cheerful slots, I find quite some fruity mobile slots hidden between other cheerful mobile slots like Jack and the Beanstalk Touch®, Flowers Touch® and Piggy Riches Touch®. If in need of some Vitamine C, I can highly recommend one of the fruity mobile slots Fruit Shop Touch®, Reel Rush Touch® and Stickers Touch®. As fruity as Fruit Shop Touch®, you can expect an explosion of bright colours in Stickers Touch® combined with modernly designed fruit symbols. Although if looking at the slot features used, I would rather compare Stickers Touch® with two of the most popular mobile slots Jack Hammer Touch® and Jack Hammer 2 Touch®. It is the sticky character of the Sticky Wilds and Sticky Spins that make me think of the two Jack Hammer Touch® Games that became so incredibly popular because of the Sticky Win feature. As perfect as the sticky slot feature fits the Jack Hammer Touch® games, I’m sure no other slot feature would have been more perfect for Stickers Touch®. The Sticky Wilds and the Sticky Spins seem to be made for each other and the moment these two keep on going as if there’s no end, you can look forward to big winnings going up to 80.000 coins and with that €80.000. A very attractive Return to Player of 96.69% and a high Hit Frequency of 28.36% will be of big help reaching high levels of winnings. When a Sticky Wild symbol appear on the five reels it will act as a Wild substitute in the first place, but when it is time for the next spin it will become a Sticky Wild, sticking to the reel for at least one more spin. If another Wild symbol appears on the reels during the re-spin the Sticky Spin feature continues with by now, not one, but two Sticky Wild symbols glued to the reels. The Sticky Spin feature will keep on going and all Sticky Wild symbols will hold their position for the entire Sticky Spin session until no new Sticky Wilds appear. The more Sticky Wild symbols end up on the reels during the Sticky Spin feature, the more chance of a big win you will have. Enjoy Stickers Touch® as much as its online slot version without loss of quality thanks to NetEnt who has been a true pioneer in developing online casino games and live casino games, while the Swedish software developer has been ahead of the competition ever since the company released its first mobile slot game in 2011. Gonzo’s Quest Touch® was the ever first mobile slot game released by NetEnt and ever since tens of mobile slots have been developed so far by an extremely talented team of developers with mobile gaming becoming more and more popular as well. It was in 2014 that for the first time ever, NetEnt launched a slot game – The Invisible Man™ -developed entirely in HTML5, becoming a standard for both desktop and mobile, which simply means that also Stickers Touch® has been developed in HTML5.